Where & When is a quarterly travel guide filled with hundreds of things to do in Pennsylvania. Events, destinations, and attractions to help plan your vacation, weekend getaway or excursion. It's what's going on in PA! 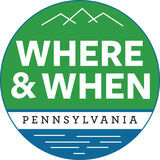 Check out whereandwhen.com for thousands of destinations and things to do in Pennsylvania!